In the current AutoQuad release an two axis gimbal control is available, pitch and roll. The roll control is opposite the multicopter rotation and pitch opposite the multicopter pitch move so the gimbal will stay level at all times. With aux3 on the transmitter, the pitch control can be adjusted while still keeping the AutoQuad control over the pitch. So you can adjust the pitch for looking up or down. First you need to set the pwm ports for the gimbal. note if you use analog servo’s that run on 50-100Hz you need to select two ports that don’t share the defined motor timers and compile your own version (for now). 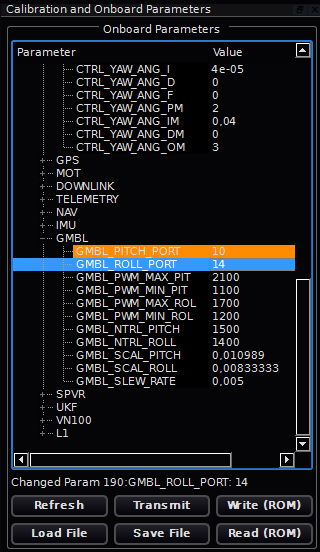 Note: If you want to reverse your servo movements you can achieve this by adding a negative value (minus sign) in the GMBL_SCAL_PITCH and GMBL_SCAL_ROLL settings. Several options are available for finetuning the gimbal control. 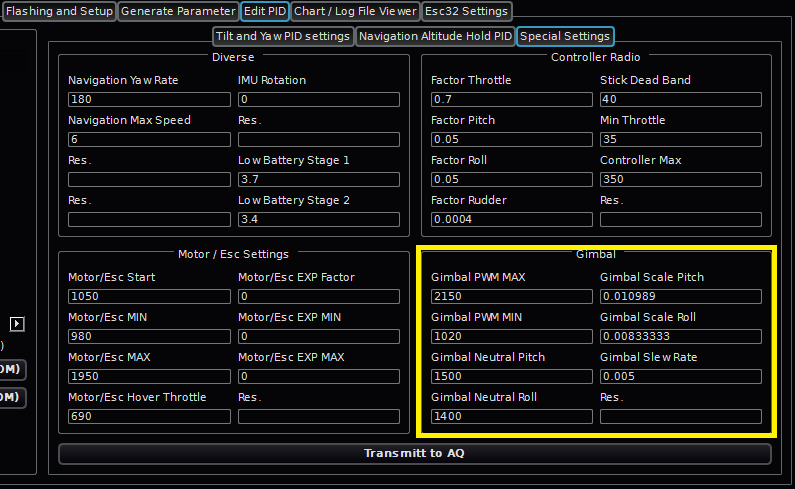 Gimbal slew rate Pitch only, reaction speed on manual (aux3) control of the pitch. If you roll the multirotor and the roll servo does compensate enough to keep the gimbal horizontal, you need to adjust the Gimbal roll scale. If the angle is too low, you should slightly increase the value, if the angle of the roll servo is higher then the angle of the copter you should slightly lower the value. If you want to accelerate the aux3 pitch control, so make it react faster on aux3, you should slightly increase the Gimbal slew rate value. 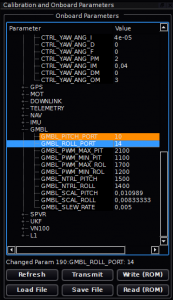 To set the Gimbal ports you can open the Calibration and Onboard parameters widget, click on refresh for the retrieving the latest values and open the GMBL tree. The parameters PITCH_PORT and ROLL_PORT can contain the pwm port numbers of the servo’s. In this example port 10 and 14 are used (upper right upper and upper right bottom pwm ports). Save them by transmitt & write. Only when using digital servo’s capable of running at 400hz. For other frequencies a compile is needed (for now).